Breakthrough golf book shows you how to use videotape, measurement and good sense to perfect your golf swing! Most golf books are about "tips" or swing plane theories. To improve golf swing mechanics you don't need tips or theories. You need to increase the precision of your ball striking! The path to golf swing perfection is simple and sensible. To perfect any process you must first measure it. Just looking at slow motion videos or still photos of your golf swing is not enough. Your video analysis must include measurements. You know your spine angle and front spine angle are important. You don't know how to measure them, or what they should be. The Efficient Golfer teaches you exactly how and what to measure and what results to seek. You know drive distance depends on how far you rotate away from the ball at the top of your backswing. Do you know how to measure these ranges? Or how many degrees they should be? The Efficient Golfer shows you. You know you need to generate hip speed on the downswing. Do you know how to measure your hip speed, or what it should be? The Efficient Golfer shows you that too. You know you start your downswing sequence from the ground up. Do you know how to measure the separation you need between the timing of your legs, hips, shoulders, arms and hands? The Efficient Golfer shows you why separation is critical. Going from a handicap of 5 to a 2 requires much more precision than going from a 15 to a 10. Precision like this can be perfected either by years of tedious practice or by just a few months of measurement and correction. Just as measurement and analysis have improved the efficiency of your golf clubs, measuring and analyzing your swing mechanics will improve the efficiency of your golf swing. It makes perfect sense. You don't have to buy software or use a computer to make these measurements. All you need is a camcorder, a common protractor and The Efficient Golfer. Here's one of our pro golfers before we worked with her. Her spine angle changes from 40° to 28° in the 0.3 seconds it takes to go from the top of her backswing to impact. Now look at her spine angle after measurement and correction. This change alone improved her accuracy so much she was able toquadruple her tour income in just one year. You play golf with your body. Like most pros and single-digit players, you probably follow some form of fitness regimen. But just how flexible do you need to be for golf? And how strong do you need to be? Only The Efficient Golfer shows you how to measure your flexibility and strength for golf. For instance, you need 60° of internal hip rotation for an unimpeded backswing. Do you know how much internal hip rotation you have? You won't know unless you measure. The Efficient Golfershows you how. If you have less than 60° of internal hip rotation, you'll tend to slide your hips. This makes it more difficult to square your clubface at impact. Less than 60° of internal hip rotation also increases your chance of developing low back pain. For more than 35 years, I've been helping athletes improve their performance with frame-by-frame videotape diagnostics. My tour players have won the US Open, improved their ranking in putts per round from #113 to #1, quadrupled their tour income, and increased their longest drive from 295 to 400 yards. I have written for The New York Times and Golf, served as an NBC Sports broadcast analyst for the Olympics, and have been the subject of articles in Sports Illustrated, Golf Digestand many other national magazines. The Efficient Golfer takes the mystery out of golf. You'll no longerwonder why you’re not getting better. You'll know exactly why - and what to do about it. You won’t need to practice endless hours, because your more efficient swing requires less practice. A better swing. Better scores. The Efficient Golfer will be your guide to the perfect golf swing. It's a handsomely designed trade paperback of 173 pages, with more than 160 drawings. After your purchase, we'll email you valuable bi-weekly tips, suggestions, and insightful stories from our 35 years of working with pro golfers. Canada orders ship by US Priority Mail; delivery can be up to two weeks because of Canada Post. International orders shipped by International Priority Mail. We also invite you to view our very successful Power Hip Trainer, the only aerobic exercise machine to add 25 mph or more to your swing speed. It does this by taking advantage of the speed multiplier built into every golfer: just a one mile an hour increase in hip speed will add 25 mph to your swing speed. Strengthening your hips with the Power Hip Trainer will also lower your handicap. A university study found that scratch golfers had the strongest hips of all golfers tested. You may also want to learn about our new golf stretch DVD. 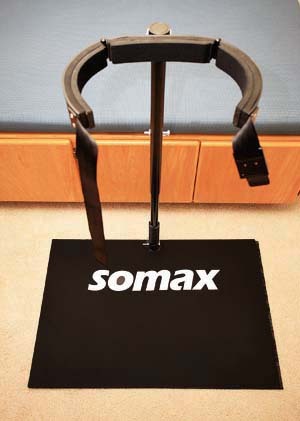 It shows you how to measure and stretch your core golf ranges. Using videotape, measurements, and good sense to improve your swing and putting mechanics.